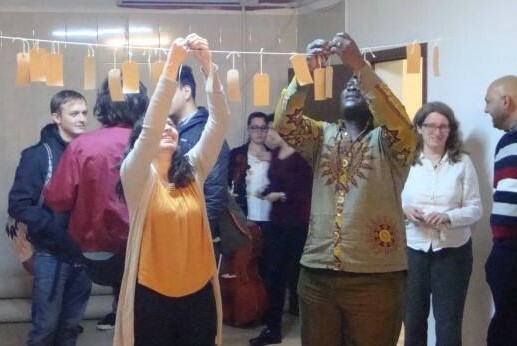 In November 2015, the researchers in the Creative Arts and Translating Cultures (CATC) and Researching Multilingually and Translating Cultures (RMTC) hubs visited the two Case Study 3 (CS3) researchers in Bucharest for a ‘mini-symposium’. Held in the offices of the Romanian Association for the Promotion of Health (ARPS), this two-day event strengthened the collaboration between the hubs and the case study (which focuses on researching and working multilingually at the borders of the European Union) and gave everyone the opportunity to meet again, exchange ideas and discuss issues that arise when working and researching multilingually. The reflections were further nourished by the presentations of Luciana Lazarescu, researcher at the ARPS, on immigration in Romania and of Jing Hiah, PhD student at the Erasmus University Rotterdam, on her research on Chinese migrants in Romania and in the Netherlands. When preparing the symposium, the CS3 researchers thought of organising an associated event bringing together members of the research team and participants involved in the case study, with a view to ‘giving something back’ to groups and individuals in Bucharest who had generously given their time, help and expertise to the CS3 researchers. The idea then was to follow the example of the Language Fest that took place in November 2014 which brought together 40 college students in the Centre for Contemporary Arts in inner-city Glasgow to celebrate the diversity of languages present in the city and explore what speaking and learning multiple languages means to people in their personal lives. Once again, the aim would be to celebrate the diversity of languages present in the city of Bucharest and explore how people from different backgrounds learn, speak and use different languages in order to communicate with each other in their everyday lives. Julien contacted colleagues at Conect (formerly known as ADO SAH ROM) to see whether a ‘workshop’ could be organised with this NGO whose aim is, among other things, to help migrants integrate in Romanian society. Julien had started collaborating with Connect in the summer and Rodica Novac, the Director of Conect, immediately gave a positive and enthusiastic answer. Julien and Rodica met a few times to discuss organisational aspects of the workshop and they organised a Skype meeting with members of the research team based in Bulgaria and the United Kingdom at the end of October 2015 in order to plan the event further. 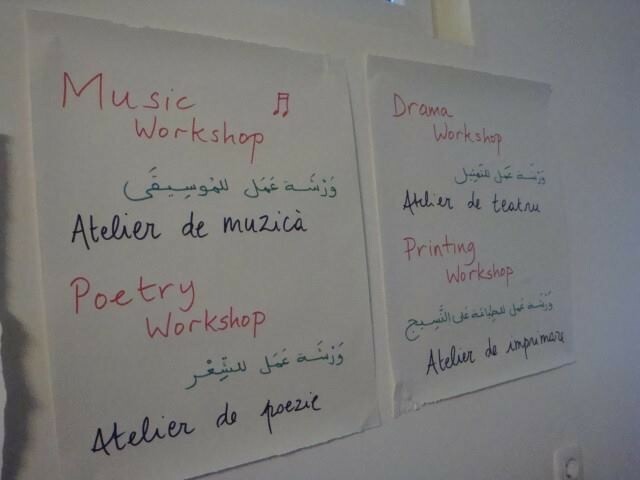 It was agreed that the event would take the form of four workshops: Drama, Poetry, Music and Crafting. The challenges and questions were numerous: Who was going to come? What would the participants’ expectations be? How to make sure that everyone would feel welcome? How to overcome different barriers, such as language barriers when the organisers of the different workshops did not speak Romanian or other languages of the participants and when the participants might not speak English? The event took place on 5 November 2015 in the evening and was attended by around 40 participants. In the Drama Workshop, Katja and Jane facilitated a range of simple drama exercises as a way to celebrate and reflect on the languages and experiences that everyone carries with them. In the Poetry Workshop, Tawona and Mariam led the participants through a range of creative writing exercises with the aim of bringing out their own poetic voices. In the Music Workshop, Gameli and Richard invited participants to translate their languages and lives into sounds and rhythms. In the Crafting Workshop, Cecilia and Prue led participants to print Ghanaian Adrinka symbols and explore how these relate to their life experiences. At the end of the workshops, a buffet dinner was served and everyone gathered in the main room and showed to others what they had done in their workshops. Participants were invited to write reflections about their experience on tags that they were given at the beginning of the workshops and invited to attach to a string suspended across the room at the end. The encouraging and enthusiastic comments that they wrote on those tags and the warm atmosphere during the dinner showed that the evening was a rich experience for all. After the event, all colleagues were invited to reflect on the workshop they had organised and over the next few weeks we will present their reflections on the blog. Julien and Robert would like to thank particularly Luciana, Andra and Stefan at the ARPS for the kind help and support with the organisation of the mini-symposium and Rodica and Simina at Conect for their commitment and enthusiasm for organising the workshops (and for the pictures), it is thanks to them that the mini-symposium and the workshops were such a success. This entry was posted in Case Study 3, CATC, Events, RMTC and tagged Bucharest, Case study 3, CATC, RMTC, Romania, Symposium, translating cultures, workshop. Bookmark the permalink.